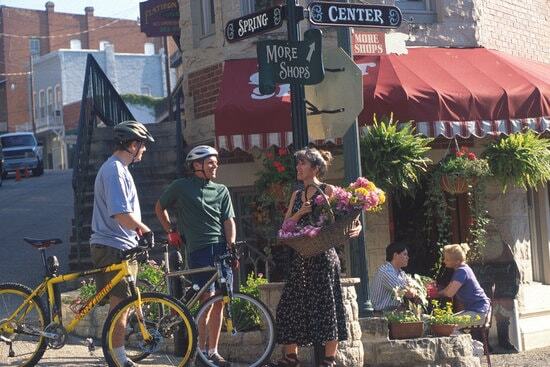 The things to do in Eureka Springs will surprise you. 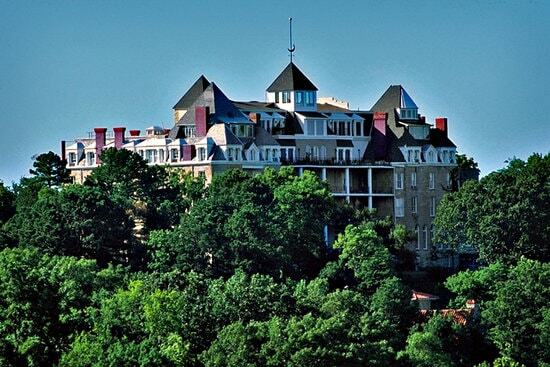 If you haven’t been to Eureka Springs, you absolutely must make time to visit this marvelous Victorian-like village. The historic streets are lined with chef driven restaurants, unusual eateries and more than 100 small, unique shops and galleries of every description. This is the place to shop until you drop. If outdoors and mountain biking are your thing, Lake Leatherwood, a 1610-acre wilderness park and lake, has 25 miles of some of the best biking trails to be found in all of Northwest Arkansas. First find a fantastic deal on hotels, Search Here for Hotels.com Best Hotel Deals! 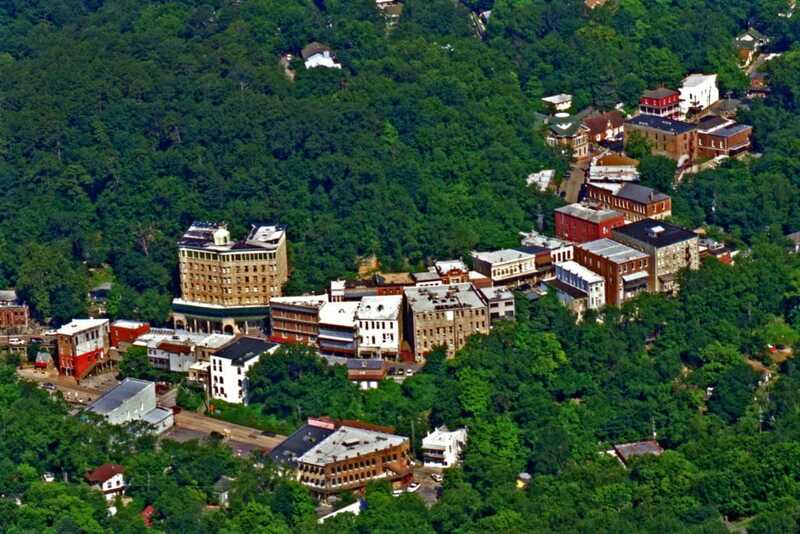 The Downtown District is listed on the National Register of Historic Places, and Eureka Springs has the largest collection of Victorian architecture in the central U.S. The Eureka Springs Historical Museum, located in the 1889 California building, is the place to learn about the colorful past of this beautiful little Ozarks Mountains city. Make sure to visit the old 1886 Crescent Hotel & Spa and the Downtown Cornerstone Bank where you’ll see a bank operating much as it did in yesteryear. You can see the old brass teller cages, pot-bellied stove, original business machines and much more. A favorite watering hole is Grotto Wood-Fired Grill and Wine Cave. Yes, it is a restaurant set into a cave, and the ambiance is welcoming, warm and intimate. The beautiful crafted cocktails are fresh, smooth and amazingly delicious. 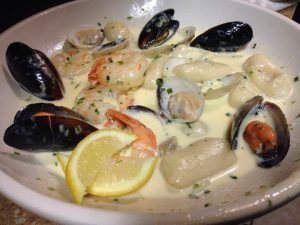 Ermillio’s Italian Home Cooking serves fine Italian food in a delightful charming atmosphere. Be prepared to wait a bit, but there’s a small bar upstairs that will make your wait more enjoyable. or… Grand Taverne Restaurant & Lounge offers fine dining extraordinaire including Stuffed Portobello Mushroom, Roasted Rack of Lamb and several steak choices. Service is impeccable. or… Chef Katherine Zeller is at the helm of Cafe Amore, which is located on E Van Buren just a short drive from downtown. Chef Zeller creates some of the very best Italian food to be found in the region. The atmosphere is intimate, warm and inviting and the service is outstanding. Last, but not least, Devito’s Eureka Springs has spectacular sky dining and a delicious fish dish that will hook you for life. Looking for more dining options? 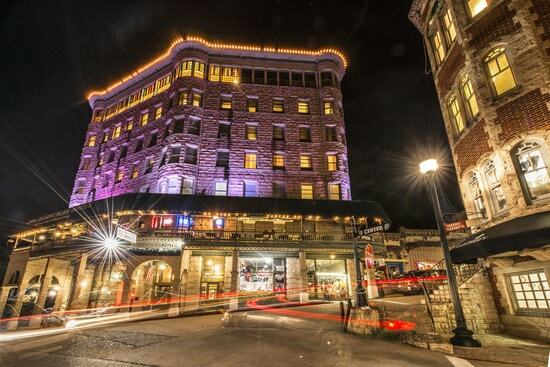 Here are the Best Restaurants in Eureka Springs. Eureka Live Underground features Eureka’s only Downtown Underground Video Dance Bar and Beer Garden. No trip to Eureka would be complete without checking out Basin Park and the old Basin Park Hotel in the heart of downtown, and Thorncrown Chapel located just a short drive out on Hwy 62 West. After you’ve stretched your legs a bit, head on over to Local Flavor Cafe, a fabulous farm-to-table restaurant with indoor and balcony seating. The food is always fresh, tasty and good for you. Mud Street Cafe, an old fashioned street level restaurant, is the place to go for fabulous coffee, desserts and breakfast. If you are looking for a southern style buffet breakfast that serves excellent food, then The Filling Station Restaurant is the place for you. It serves breakfast and lunch in a family friendly atmosphere. The delicious biscuits are made in house, and they are simply scrumptious. There are more than 20 art galleries in Eureka, which taken together support in excess of 400 artists. 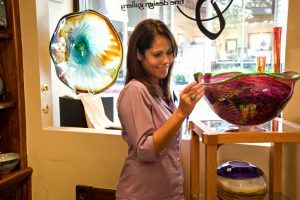 You’ll find award-winning painters, sculptors, potters, jewelers, weavers, woodworkers, wood carvers, scrimshanders and tole painters. You may be lucky enough to catch a few of the artists at work when you visit the Art Colony on N Main St. The Great Passion Play, America’s #1 attended outdoor drama out on Passion Play Rd has 150 Biblically costumed actors. Try the Cottage Inn on W. Van Buren for a delightful Mediterranean lunch, or if you’re in the mood for Mexican food, try the Pescado Fish Tacos at Aquarius Taqueria. Other smashing lunch options are Oscars Cafe and the Sweet and Savory Cafe. Oscar’s offers homemade treats like waffles with lemon curd, bacon and brie quiche and a killer chicken salad sandwich. The Sweet and Savory Cafe specializes in an varied menu and impressive array of baked goods. Another really good place to try is The Rockin’ Pig Saloon is a full-service biker & family friendly restaurant, bar and entertainment establishment that offers incredible burgers, sandwiches and bbq. If you are looking for a cool restaurant and incredible food, then you must visit, Sparky’s Roadhouse Cafe, you will love everything on their menu including delicious burgers of every type, homemade desserts and a variety of enchiladas. 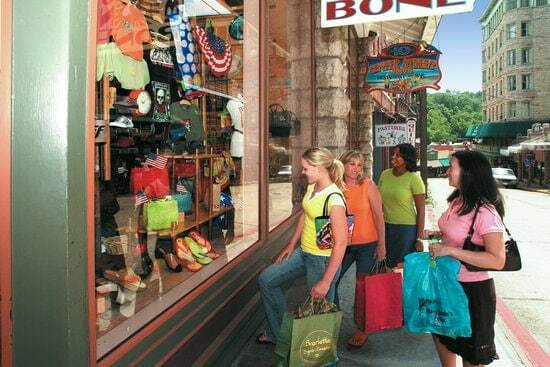 Eureka Springs Historic Downtown Shopping District has more than 100 unique specialty stores and boutique shops including a family-owned candy factory, antique shops, jewelry stores featuring the work of local artists, a nut store and much, much more. Visit Caroline’s Collectibles to see live bunnies actually working. They give you a receipt and change. You may need to drop your purchases off and rest for a few minutes before you start the evening. or… If you’re not into shopping, treat yourself to one of Eureka’s premier state-of-the-art spas. Spa 1905, located on the second floor of the Basin Park Hotel specializes in Duet Massage, Traditional Massage, Stress Fix Massage and more. 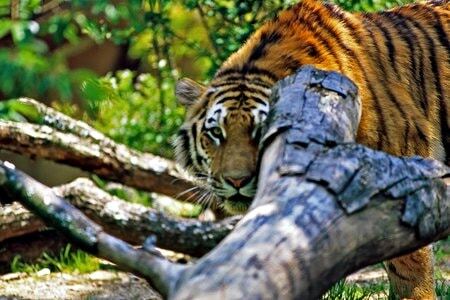 or… For those who enjoy adventure and inspiration, tour the Turpentine Creek Wildlife Refuge. You’ll see a huge and modern refuge for abandoned, abused and neglected ‘Big Cats’ including Tigers, Lions, Leopards and Cougars. Unique lodging opportunities are also available on the refuge. Does water recreation appeal to you, Beaver Lake a huge man-made reservoir has some of the best fishing and water related activities in the country. Along with specialty stores and boutiques, Eureka’s cobblestone streets are also lined with restaurants offering fun streetside patio seating and balconies. Aquarius Taqueria has a wide range of craft-cocktails along with heavenly, smooth margaritas made with 100% Blue Agave tequila & Patron’s Citronge Liqueur. They are delicious but strong – best to set your limit on these. Nightlife in Eureka includes Henri’s, a great little downstairs bar offering craft cocktails, beer and pub grub; The Cat House, specializes in cold beer, friendly service and has a great vibe. Going to Bentonville? Here are Things To Do in Bentonville AR!! Going To Rogers? Here are some awesome Things To Do in Rogers AR! Going To Fayetteville? Here are Things To Do in Fayetteville AR!